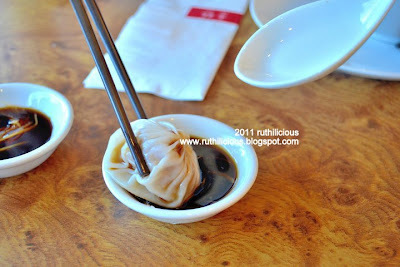 ruthdelacruz | Travel and Lifestyle Blog : New Restaurant in Town: Shi Lin - There is More than Dumplings! 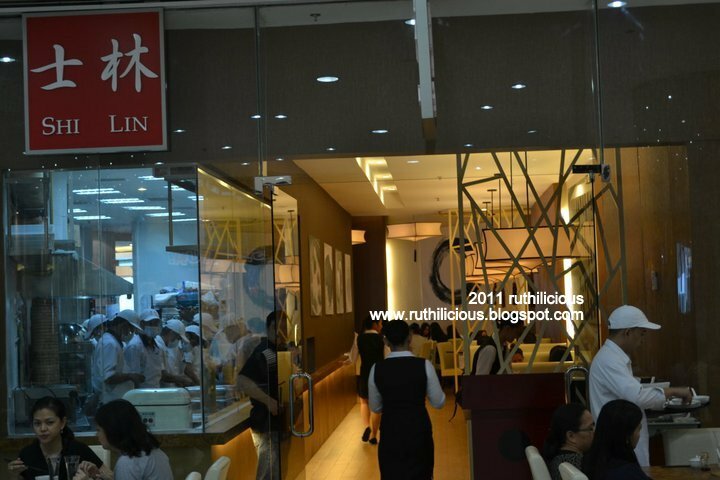 New Restaurant in Town: Shi Lin - There is More than Dumplings! My friend invited me for lunch to the newest Chinese (or is it Taiwanese? 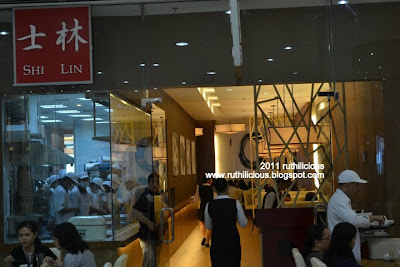 - Google has yet to let me know) Restaurant in Town - Shi Lin. This restaurant may be the reason he suggested to meet up in Podium. I am not very enthusiastic about food lately because I am preparing myself for the beach trip next weekend. I have passed on the latest deals like buffet and 50% discounts, BUT since I can no longer wait for our China trip this year, I am so ready to go Chinese even for one day. The Shi Lin Restaurant is located at the 3 Level of Podium, in Ortigas Center. When I saw the signage, I was surprised to see tables and chairs arranged outside the store (that got me thinking that this restaurant is getting a good guest turn-over). Entering the restaurant, I was greeted by the show window with the kitchen crew kneading and rolling doughs in full concentration, not minding the guests entering the restaurant and looking curiously at them. I have read somewhere that these chefs were even trained in Taiwan and there is a head chef supervising the kitchen, to ensure that new crew does it right. I love the simplicity of the interior. Creme walls, the usual tables and chairs, - and couches for four-seater tables, no Buddhas, no waving golden cat (or I have missed them?) 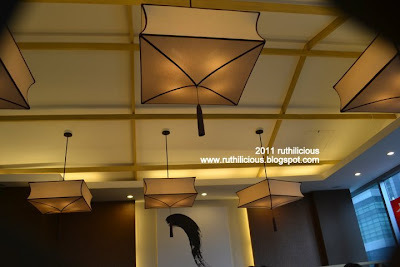 - the place is just relaxing, and neat and immaculate with soft lighting. Each table has an instruction guide on how to eat the Xiao Long Bao - which makes a good "side piece" (not a centerpiece, as it is placed on the side of the table). Xiaolongbao (otherwise ""Shao long Bao" in westernized spelling) is a type of steamed bun or baozi from eastern China, especially Shanghai and Wuxi. 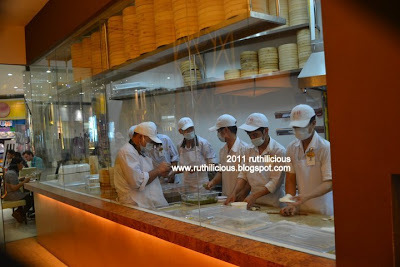 It is traditionally steamed in small bamboo baskets, hence the name (xiaolong is literally small steaming basket). 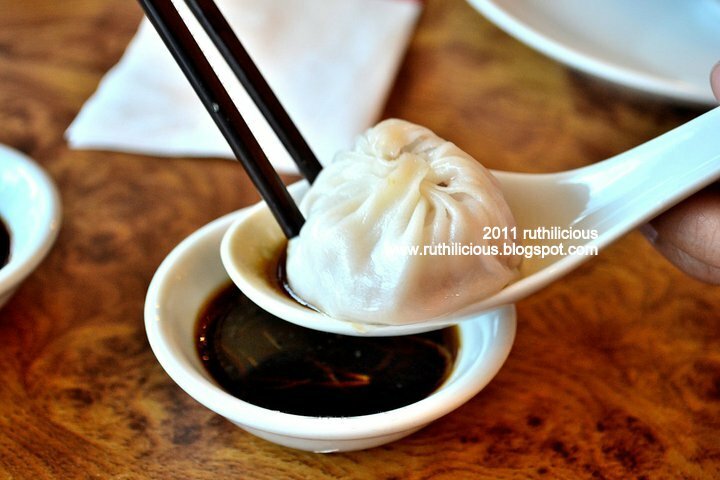 Xiaolongbao are often referred to as soup dumplings or simply dumplings in English, but are not regarded as "dumplings" in China (from Wikipedia). I was telling my friend the designer might have ran out of ideas on what to display on this side, and just grabbed a roller and dipped it in a black paint and voila! I love the lamps - so classy and elegant. 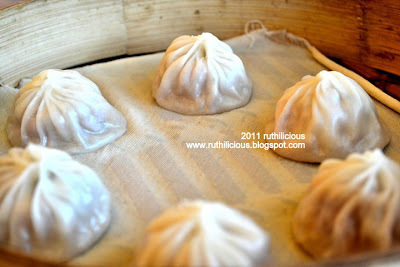 We ordered the Xiao Long Bao (Php128 for 6 pieces). Using your chopstick, grab one piece and dip in the soy sauce mixed with ginger. Place the Xiao Long Bao in a spoon and poke the middle to release the steam. Put ginger and enjoy with broth. I have tried it first without the sauce, and it is just good! 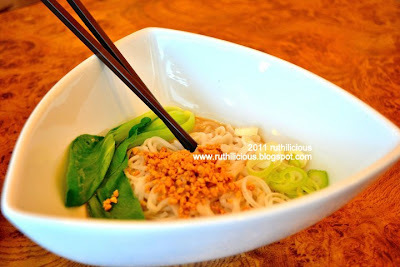 The Noodles with Sesame and Peanut Sauce is superb (Php130)! If you are wondering if it tastes like Kare-kare, no it is not. For the benefit of those who doesn't have a very adventurous tastebuds - it is more of a pasta than a soup - because it doesn't come with broth/soup. I love the fact that it is creamy and nutty in a non-peanut-buttery-way. This is a must-try! 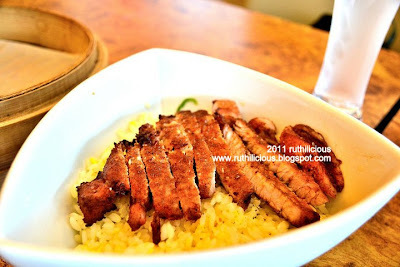 If my blog is a menu, I'll add a star next to this dish's name to say that it is the bestseller! The Rice Pork Chop (Php185) is not your typical dish you can order from any restaurant. The pork is tender and tasty - no soy sauce, or flavouring is needed, but I opted to eat it with the chili oil (which is also good compared with other Chinese restaurants). 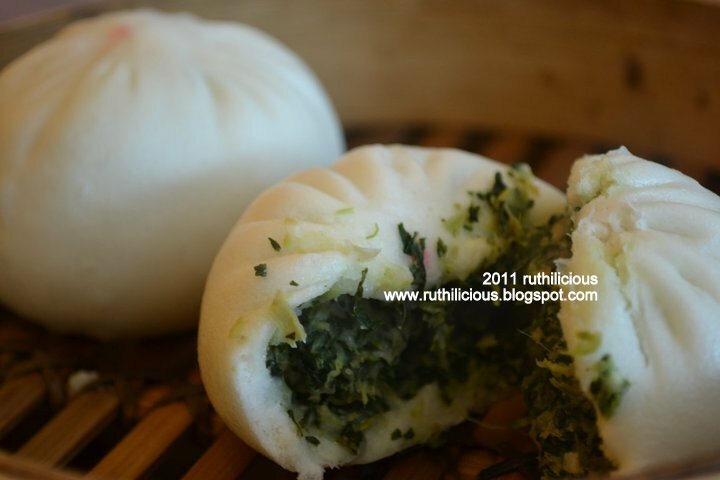 Another must-try is the Vegetable and Pork Bun (Php98 for two pieces). 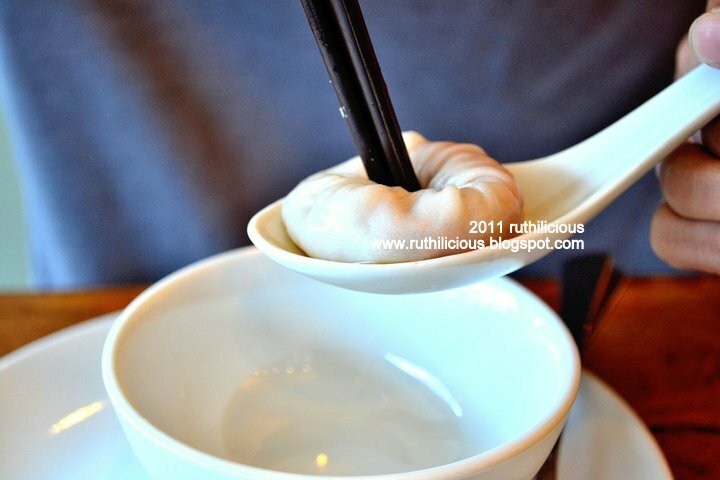 What I like about this bun is it doesn't have that after-taste (that taste in your mouth that lingers after eating Chinese food? - okay, it's hard to explain, but I always get that feeling in my mouth after eating dumpling). I am biting and chewing this bun until the last bit just to feel and taste the pork, but I can hardly taste it - which is good for me. The Chinese guy (could be the owner or manager?) who was standing in the front door was even smiling and grateful when we asked if we can take pictures of the kitchen crew. Exact opposite of the other restaurants which staff is very vigilant in warning and forbidding the guests from taking pictures, as if we were paparazzis. Total Bill: Less than Php600 for the two of us (service charge of 5% is already included in the bill). Php300 budget each person is safe. Accessibility: It is in Podium, you can come from Galleria or Megamall. You can bring a car or commute. Payment Options: Cash and Credit Card (they accepted my credit card) - so I am guessing they accept Visa or Mastercard. Low Lights: There is no complimentary tea. Tea is available for Php55 per glass/cup - and it comes with different flavors. Anyway, we are not dining for free tea, so it is totally fine. We didn't order drinks since we are trying to stay healthy with water. I love this place and I would highly recommend! Simple, tasteful and affordable. Thank you to my friend for the wonderful pictures. Love that camera! If not for maintaining a certain weight, I want to open a food blog. Burp! 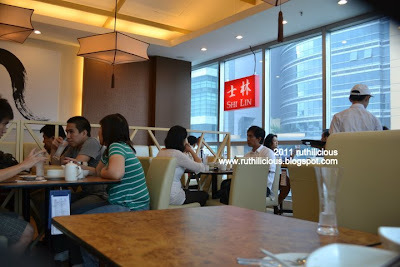 © ruthdelacruz | Travel and Lifestyle Blog : New Restaurant in Town: Shi Lin - There is More than Dumplings!